It is <<Labor Day>> in USA and the end of a 3 day holiday. In France it is the return to school for children. It is drizzly and cool when Sandy walks to the boulangerie to buy our breakfast. First a quick stop at the <<poubelle>> (garbage bin) and recycling center to drop off garbage and recycling. At the boulangerie, Sandy purchased a pepito for our breakfast. A pepito is croissant dough filled with creamy yellow custard and semi-melted chocolate chips. It is rectangular in shape and big enough for two people to share. Delicious! We had nothing planned for today so decided to go to the <LIDL> store. The store is advertised on the television, in the newspapers, and on billboards. From the advertising, we expected it to be similar to a <<Target>> with clothing, household goods, and groceries. We took the bus from Intra-Muros to the Gare (train station). Then we transferred to the #4 bus. We passed the <<E.LeClerc>> store and the IUT school. We got off at the stop called <<CAP SUD>, walked across the street and found the <<LIDL>> store. It is smaller than the <<Intermarché>> grocery store where we usually shop or about the size of the <>. It looked similar to an <<ALDI>> but seemed to have more variety than the <<ALDI>> we shopped at in Holland, Michigan. We looked at everything, but we didn’t buy anything. The prices were slightly cheaper than at Intermarché and Carrefour. It was easy to get to, no problem with the buses and a good excursion. By the time we returned, it had stopped raining and the temperature had risen. The streets were starting to dry. There was a cruise ship moored in the basins called <<Variety Cruises>>. It arrived around 5h at high tide and will leave later this afternoon during the second high tide of the day. Sandy shopped for our breakfast croissants and as usual this time of year is amazed at the number of high school aged students she passes walking on the streets that live here year around. They were walking towards the <<Porte de Dinan> to catch a bus to school. You can never tell from walking down the streets during the summer, to the beach, or around the town just how many local citizens there really are living here. First a brief stop at the marché for fresh fruits and tomato from the vendor <<Monsieur Alix>>. Then we were on our way to the Intermarché grocery store. We needed cereal, juice, Perrier, etc that we can not buy at a market. The forecast is for a high temperature of 23C / 74F, but it was cool and cloudy during our shopping trip. There is another cruise ship moored in the basin called the <<STAR PRIDE>. It was at least 3 decks higher than the <<VARIETY VOYAGER> ship moored here yesterday. After breakfast we caught a bus to the Gare. We wanted to return library books to the <<Médiathèque>>. Next we walked to the Intermarché grocery store. We were invited for an aperitif tonight at our friend Alain’s house. It is customary in France to take a gift when you visit people. We wanted to take some flowers. France has school for 4 and a half days a week with students leaving early on Wednesday. As we walked past the middle and high school equivalent, we saw students pouring out of the building. It was cloudy all morning but in the afternoon the sun came out of the clouds and the day was very nice. Sandy took advantage of the nice weather and brushed off the outdoor furniture from our balcony. We will store it in our second bedroom over the winter. It made her a little sad to have to put it away already for the winter season. Our friend Alain picked us up and took us to his apartment. It is very near the hospital but in a gated area. There is only one building in his complex and it is surrounded by trees. Thee is a very pretty rocky wall behind his building and there are private houses on the other side of the wall. We sat at his round dining table which is in the middle of his salon. He has lovely furniture and decorations. He and his wife have lived there for 15 years. They have a fairly large balcony and feed many different kinds of birds on it. We enjoyed a glass of <<Pineau des Charentes>> for Sandy and Porto rouge for Phil. He prepared 3 different plates of appetizers. One was salmon(saumon), one of tuna (thon), and one of chicken (poulet). Some had pickles (cornichons which are pickled cucumbers much milder than USA cucumber pickles), cherry tomatoes from his yard, and some <> (fish eggs from the lumpfish, an alternative to sturgeon caviar). We really enjoyed our time and the conversation. He brought us back to the <<Esplanade Saint-Vincent>> where we took a bus to the <<Dugay Trouin>> stop just around the corner from the destination restaurant..
We met our friends Jean-Louis and Claudine at the restaurant L’Oliver for pizza. It was high tide at 20h22 and very windy. The streets had barricades on them with warnings of water on the pavement. We looked out the window just across the street at the waves going over the walls. The conversation and pizza were wonderful! The forecast is again for cloudy and cool. Our friends told us last night that summer is over for this year. Last year everyone was still swimming and sunbathing this time of year. After breakfast we mailed a letter and stopped in at the <<Hotel Quic n’Groigne>>. We visited with Marie Dominique and Michel while drinking a cup of coffee. They are already fully booked for the <<Route du Rhum>> race in November 2018. Bravo for them! 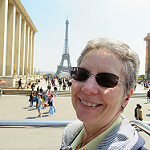 Sandy shopped for our breakfast and at the marché for fruit before we took the bus to Christine’s house for tutoring. The bus left <<Esplanade Saint-Vincent>> two minutes late, then we changed drivers at the Gare before arriving at the <<Paramé Mairie>> bus stop which is our destination, almost 10 minutes late. We walked quickly to Christine’s house. We were later than usual and the wind was quite chilly! The forecast is for rain later in the day and it did not rain on us. On our return trip the bus stops at the Gare. There was a car stopped in the road, letting cars out of a parking lot and blocking the bus. The bus driver blew his horn at it. The man driving the car did not like it and decided to let several cars out of the parking lot just to irritate the bus driver. The bus driver leaned out his window and yelled at the car driver. The car driver got out of his car and came to the door of the bus to yell at the bus driver. All of the passengers were quite interested. Several passengers got off the bus with the bus driver to look at the location of the car. After another 5 minutes of yelling, the car driver got in his car and drove away. The bus driver continued on his route. It was an interesting trip for tutoring today! We wanted to go to a flea market in the Découverte area of Saint-Malo, but it was cloudy and drizzly when we woke up today. Since it really did not rain around 11h we decided to take the #2 bus to see if the flea market was open. It was a quick bus ride, but no one had set up any tables for the flea market. It began to sprinkle as we walked back towards the bus stop and the Intermarché grocery store located at Découverte. We hurried to the store and picked up a light bulb, ice cream, and small macaroni. We waited 10 minutes for the bus and returned to Intra-Muros. The rain held off. We had been home getting ready for lunch when it started to rain very hard. Living in a building made of granite prevents a lot of noise from reaching us, but we did hear this rain. It was over quickly. After lunch, the sun came out and we spent a bit of time at the harbor. We saw the pilot-boat lead the <<Commodore Goodwill>> out of the channel and the shuttles from a cruise ship make trips back and forth from the dock to the ship. The ship was called the <<Silver Muse>> and was too large to enter the locks and the basin. Even though the temperature is cool, low 60F’s, the sun was wonderful and the air, as always, was fresh. Around 6h there was a lot of noise coming from the apartment downstairs. As Sandy walked to the boulangerie she saw the lady and her older son from downstairs getting into their car. It appeared to be fully packed with shopping bags. We have noticed that people in France traveling by car take shopping bags instead of luggage. People use luggage when traveling on the train, planes, or ferries, but not cars. Our thinking is that cars are almost half the size here compared to cars in the USA and there just isn’t room in cars here for passengers and luggage. The younger son, from the apartment downstairs, was still in the apartment since there were windows open. They usually only stay one month and they had been here one month this weekend. It was cool and sunny. We took a walk on the digue (sea wall by the beach) since the weather forecast was for no rain. It was sunny but very breezy. High tide had just occurred and the sea was crashing over the wall. We walked across the street for a while so we didn’t get wet. There were many people on the digue. Some were walking, bike riding, jogging, rollerblading, and riding on a Segway. We also saw several dozen people in the water on surf boards. The wind was behind us as we walked towards the digue but on our return trip it was in our face. Very cool! It’s a wonderful walk that we both really enjoy. For dessert, Sandy had purchased a couple of tarts. One was a lemon custard tart and the other was an almond tart. Very good!